So Your Dog Has Broken every Other Collar You’ve Tried? Can’t Find A Collar In A Size Large Enough To Fit Your Dog’s Huge Neck? Just Looking For A Unique, Yet Supremely Durable, Collar? Then Come To BLOCKY DOGS®! BLOCKY DOGS® Builds 1.5” Width And 2”width Heavy-duty Nylon Collars Specifically For Large And Giant Breed Dogs And Working K-9s. Each Collar Is Individually Handmade Specifically For The Dog Who Will Wear It. Choose A Style, Width, And A Base Color. Opt To Add More Color With Any Of Five Stripes Designs. Opt To Add Embroidery To Personalize (10 Font Styles And LOTS Of Small Designs). 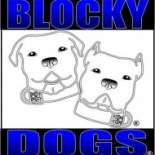 BLOCKY DOGSÂ® in Cleveland is a company that specializes in Department Stores. Our records show it was established in Ohio.